While the events of childhood are often mined by writers, little did the parents of screenwriter Kevin Williamson realize just how meaningful a simply family trip to Richmond, Virginia’s Edgar Allan Poe Museum would be in helping to shape one of the writer’s most acclaimed and popular works. For not only did the haunting images of “The Raven” scribbled on the walls in such a way that you must read your way from room to room strike the author as a young man as “the coolest thing [he’d] ever seen,” but it stayed with him all the way up through adulthood where it would go on to inspire the intelligently riveting as well as horrifyingly visceral world of TV’s The Following. From a visual standpoint, obviously this image influenced one of the show’s creepiest yet most memorable set pieces wherein the cult of likeminded murderers following the charismatic Poe scholar – professor turned slayer of coeds Joe Carroll (played by James Purefoy) – would pledge their own unique allegiance to the Poe themed madness by writing all over the walls of their secret hideaway. Yet at the same time, this particular family vacation would likewise go on to inspire the series right from its inception as a contemporary gothic work of romanticism infused horror. Originally crafted as a feature film screenplay which centered on the role of Carroll as the sole slayer of students (in a much more straightforward spin on Hollywood suspense) – Williamson wisely let his intuition and dissatisfaction with the work inform his decision to set the script aside until he could better decide how to build a much stronger storyline. Opting to venture into the same given genre with his smash successful satirical horror movie breakthrough Scream, it wasn’t until more than a decade had gone by that Williamson tackled his Poe themed project once again. Though the decision to write for television and give Carroll a cult certainly opened the work up from a writerly standpoint, personally I think The Following's success hinged on Williamson's decision to stay true to his roots. For perhaps the project's biggest creative breakthrough was in Williamson's decision to treat the audience with the same respect he’d always shown them in the past by making us feel like we’re in on the joke while playing us like a fiddle at the exact same time. Choosing to deconstruct the very art of storytelling in a way that was similar to his Scream approach, in The Following Williamson harked back to his literary beginnings – breaking down the building blocks of the horror genre by simultaneously poking fun and relishing in the conventions of the very same horror paradigm he was utilizing in a way that made the work come alive. Postmodern gothic horror that’s at once as terrifying to watch as it is intellectually thrilling to dissect – it’s no wonder that Williamson opted to put a professor at the center of the storyline as it’s a role with which he no doubt identifies – educating us about the art of fiction while using the art of fiction like a magic act over the course of The Following’s masterful fifteen episode first season run. Showing us the same respect he’d show a tenured Ivy League professor, Williamson allows his characters to address one another using the elements of fiction or more accurately the plot points that comprise of Joseph Campbell like mythic journey by name, delivering a brilliant, shocking, yet undeniably sophisticated spin on traditional television procedurals. With the villainous Carroll baiting Kevin Bacon’s retired-before-his-prime, functioning alcoholic former FBI Agent Ryan Hardy for a sequel to the true crime book that Hardy had written the first time after he’d stopped the killer -- Carroll challenges him with a second chance at being a hero with an inciting incident and other narrative elements to tempt him back on the case. Using the clichéd elements so often employed in these types of TV series – from the burned out lawman called back for one last job and a charismatic serial killer on par with Anthony Hopkins in Silence of the Lambs -- as traditional building blocks, Williamson tricks us by using them in nontraditional ways, alternately shocking and awing us with each one of the fifteen mini-movie like installments. Doing the cat-and-mouse procedural plotline one better, Williamson throws us for an undeniably creepy (if admittedly slightly far-fetched loop) upon Hardy’s realization that he’s dealing with not only with the sociopathic Carroll but with his legion of cult-like murderous followers that come out of the woodwork when you least expect it. Often former students who’ve fallen under Carroll’s spell as “audience members” to his genius, there’s a chilling undercurrent that runs through The Following about unchecked adoration and hero worship (and indeed the relationship between “artist” and “audience” running through Williamson’s oeuvre) that’s just begging to be explored in an graduate thesis. And while falling for the overall “hook” requires a certain amount of suspension of disbelief as a Poe cult is a bit harder to buy into than say the horror movie addicts turned murderers who terrorized Neve Campbell’s brainy, battle-scarred highschooler in Scream, if you meet the premise halfway, you’re in for one insanely loopy, undeniably addictive treat that only gets better as it goes along. Likewise, because it’s played straight instead of satirically, each life or death moment faced by our characters becomes that much more suspenseful as Hardy finds himself overwhelmed and outnumbered by the sudden villainy of otherwise ordinary people who work as doctors, nannies or police officers who are all more than willing to kill or be killed for Carroll. 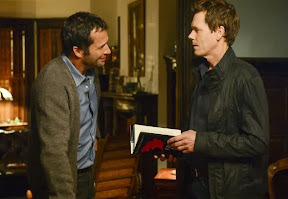 Pitched to Fox out of respect for the network that produced Williamson’s all-time favorite show 24, The Following uses one of 24’s greatest attributes in a way that instantly elevates the show by presenting us with a passionate yet similarly flawed hero who serves as the anchor of the action and Kevin Bacon plays his character with everything he’s got. Furthermore, knowing that a hero is only as strong as his nemesis, James Purefoy matches Bacon’s intensity note for note, with eerie charisma that ratchets the tension off-the-charts whenever the two share the same scene. In fact, watching them volley back and forth is not only a master class in character acting but the deeply felt histories evidenced in the weight of their words in their first scene together in the show’s pilot completely sells you on the reality of the two in their roles. Not only mentally frazzled, Hardy is saddled with a real-life battle scar from his last encounter with Carroll as well as shortly into the series we discover the professor had nearly cut out his “Tell-Tale Heart” which is the reason Hardy was forced to leave the FBI. And Hardy’s weakened heart remains a ticking time bomb in not only his physical pursuit of the man’s followers but a painful reminder of the heartbreak endured by our lead regarding the only woman the two men have ever really loved – Carroll’s ex-wife turned Hardy’s ex-girlfriend Claire (Natalie Zea). 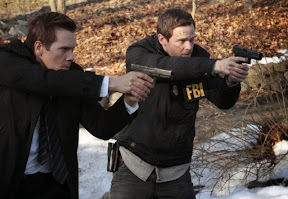 Completely spellbinding, the series is elevated by its superlative supporting cast including actress Annie Parisse’s fascinating turn as a special agent whose unique background growing up in a religious cult gives her a special understanding of the enemy they’re facing along with Shawn Ashmore’s staunchly loyal, understated performance as Hardy’s second-in-command. Although it does border on the grotesquely exploitative at times, The Following nonetheless ensures you’ll at least understand each character on a purely human level, even if it is advisable not to watch it at night. Deepening our understanding of characters in scenes most other shows would’ve left on the cutting room floor, The Following continually intrigues us by giving even the tiniest of characters some dignity and ensuring that nobody is ever painted as 100% good or evil. Williamson’s thrillingly clever series which managed to draw over 20 million viewers for its pilot alone is undoubtedly best served by binge-watching as if the season was one long miniseries in order to get the most out of the countless surprises in store from one moment to the next. 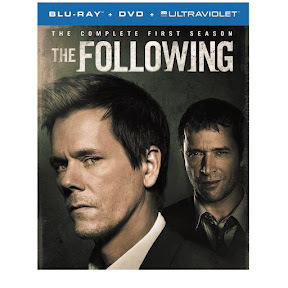 Helped considerably in successfully maintaining our suspension of disbelief by its limited season run of just fifteen episodes, The Following’s long-anticipated Blu-ray debut comes as a future-proof collection that boasts the first season in three different formats to ensure you’ll be able to get caught up regardless of whatever device you choose to watch it on. Including a duplicate of the set in DVD as well as offering a code to redeem an Ultraviolet digital high definition copy of the entire season so you can appreciate the cinematic quality of the series on a level that comes closest to the gorgeous Blu-ray transfer, The Following has been released just in time to get viewers caught up with the tragic events of the shocking finale that will lead right into the upcoming second season. 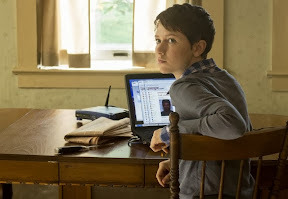 From audio commentary tracks to mini-featurettes and deleted scenes, The Following is Williamson at his best – using gothic romantic homage and postmodern literary breakdown to create network television that breaks the mold in delivering fifteen thrilling episodes guaranteed to surprise even the most experienced mystery fan.